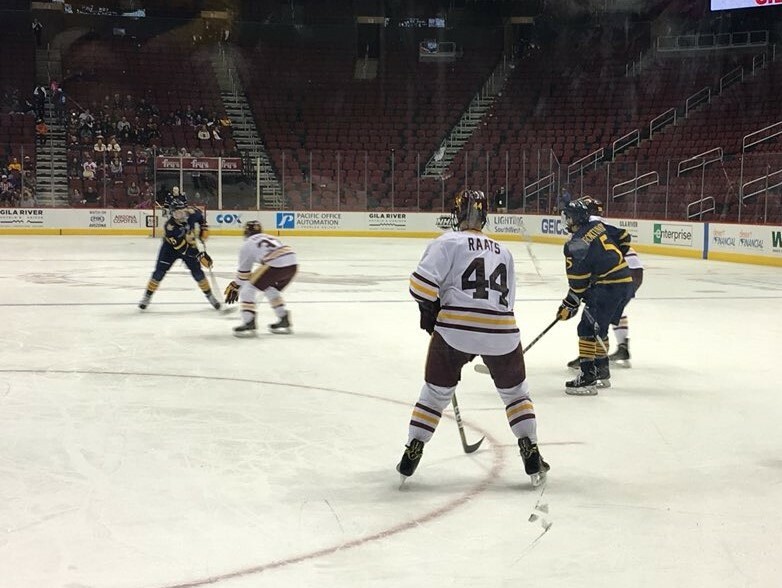 The Quinnipiac Bobcats men's ice hockey team scored four second period goals en route to a 5-3 win over the Arizona State Sun Devils on Saturday night at Gila River Arena in Glendale, Arizona. A night after struggling a bit offensively in a 2-2 tie, Quinnipiac exploded for five goals including three on the power play. This is the third straight game that Quinnipiac has scored on the power play and is now 6 of their last 10 on the man advantage after and 0 for 31 streak. Just under three minutes into the opening frame saw Quinnipiac strike first when Alex Whelan (11th goal) cleaned a rebound off a Craig Martin shot in front of the Sun Devils Joey Daccord (30 saves). "I thought we played really well tonight, said Rand Pecknold. I thought we set the tone in the first period out shooting them 19-3 and Daccord played well to keep the score 1-0. We just kept coming at them and I thought our power play was great, we executed, had good net front traffic and our defensive core moved the puck well. It was a really good effort". 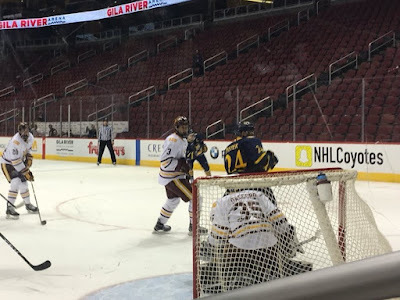 Quinnipiac took full control of the game in the second period starting with an unassisted goal from Tanner MacMaster when he curled and toe dragged the puck before firing it past Daccord. Holding a 2-1 lead and on the power play, Quinnipiac used a quick passing game to find the back of the net as Tufto fed Priskie whose initially shot was saved but Bo Pieper was there at the backdoor to put it home. A Priskie one timer little under four minutes later again on the power play extended the Quinnipiac lead to 4-1. "I thought when we had that drought we were getting good looks head coach Rand Pecknold said. In the Cornell game we had two empty nets on the power play we missed as we hit posts both times and it was a bunch of other things. We have been getting great looks and its just goalies have been playing really well against us. I thought it was a matter of time we were going to get our goals." Arizona State got one immediately back but Quinnipiac returned the favor when Pieper scored eight seconds later to make it a 5-2 lead. The Sun Devils scored a power play goal with under six minutes to play but that is as close as they got the rest of the way. Five Quinnipiac players had multi point games (MacMaster, Tufto, Pieper, Priskie, Whelan) while goaltender Andrew Shortridge made 20 saves in the win. With the victory Quinnipiac now improves to 9-12-4 on the season and now the Bobcats return home after a 3-2-2 road trip to start the second half of the season. The next game in on Tuesday January 30th when they welcome the Princeton Tigers to the Frank Perrotti Jr. Arena.